Legacy of the Weirdboy is the first DLC available for Warhammer 40k: Sanctus Reach. If you aren't familiar with Sanctus Reach, please check out my review for the base game, which can be found here. In short, it is a turn based strategy game in which the Marines of the Space Wolves Chapter take on a horde of Orks while defending the Knight World of Alaric Prime. Legacy of the Weirdboy flips you over to the other side of this bloody conflict, putting you in the green skin of Big Redd da Warphead, a "Weirdboy," or mage type of character, for those who don't speak 40k. Big Redd is on a mission to build a "teleporta" that he will use to strike at the heart of the Space Marines. Standing in your way is a deadly army of said Marines, eager to turn your Orks into so many piles of body parts. Legacy of the Weirdboy offers you a vast array of unit types to play with, as your horde is made up of Orks of all shapes and sizes, carrying a variety of weaponry. I was eager to get my hands on some units in particular, like the massive Battle Wagon and various "Meks" which sport all sorts of nightmarish pointy appendages, rocket launchers, and flame throwers. These units gave me a lot of trouble in the base game campaigns, so it was quite the thrill to use them myself. The Orks have some new units to try out as well, including a very useful medic hero. 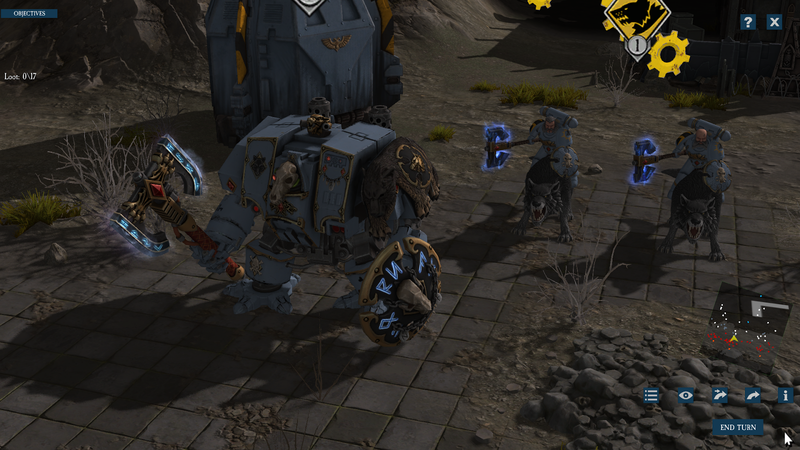 The Space Marines have a few new toys of their own that you will discover throughout the campaign. 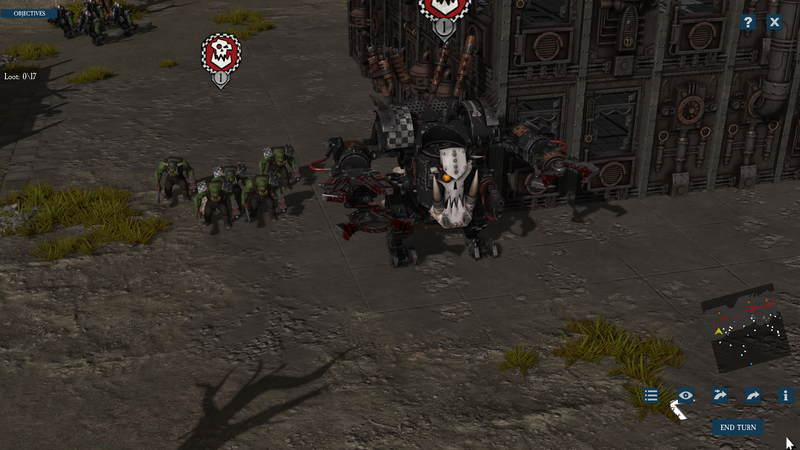 If your Orks survive long enough to kill some Marines, they can gain experience and level up, unlocking a choice of various new special abilities. Some of these can turn decent units into really vicious killers. Exploring the ins and outs of your own personal Waaagh is the meat of this experience for veterans of the Space Marine campaigns. I found that the Ork units did not handle how I expected, but in a good way. While some of your units are just living shields to distract the enemy, this is not a campaign where you can simply charge forward without finesse, hoping to overwhelm the enemy with sheer numbers. The Space Marines are heavily armed and armored, and will cut your Orks to ribbons if you charge at them recklessly. Even the most basic Space Marine squad will not go down easily, and must be dealt with in a deliberate manner. This contrasts with the Orks, who have a mixture of super-heavy units and glass cannons, with a large helping of marginally useful, but ultimately expendable, cheap units to round things out. A battle of attrition will go poorly for you, which was a lesson I quickly learned before rebooting the first mission. The DLC improves a bit on the structure of the campaign itself, but still leaves room for improvement. Like in the base game, the campaign consists of a handful of set-piece battles separated by 3-4 skirmish battles each. These skirmishes are still rather unremarkable filler, but the story missions themselves have been improved with more detailed intros and some nice artwork to set the scene. There are only four of the story missions, but each one is a hefty scenario that will take a couple of hours to complete. The overall story is still thin compared to other Warhammer 40k games, but feels much more coherent than before. I hope for the next DLC the ratio of filler to story missions is improved, since they are quite good and varied in their gameplay. Overall, this is a solid expansion for fans of Sanctus Reach, and is exactly what I like to see in add-on content. Every facet of the game has been improved in some way, while giving you a fresh new experience to enjoy. The price is a very reasonable $10. I expect we will be seeing several more DLC for Sanctus Reach, and I look forward to watching how the game evolves. Fingers crossed that we get to see the Imperial Guard join the fray! Legacy of the Weirdboy can be purchased directly from Matrix/Slitherine, or found on Steam.